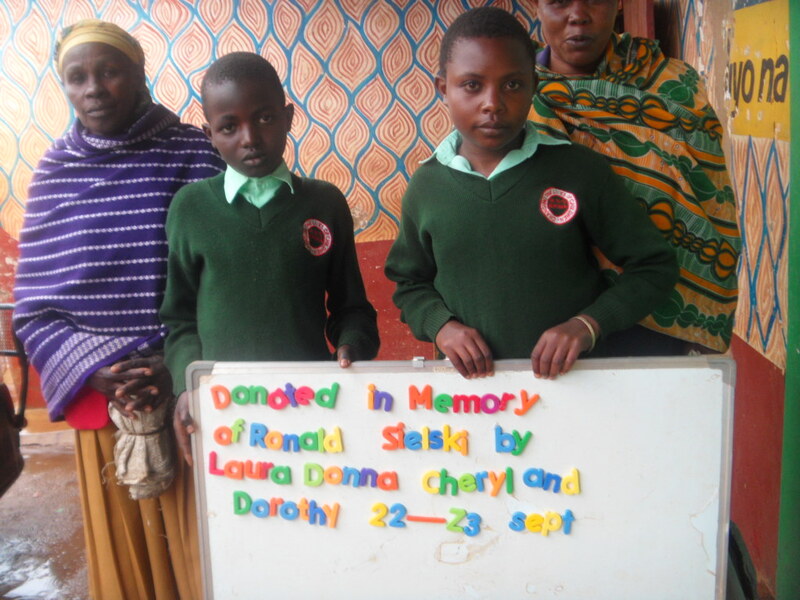 Our program has donors who directly sponsor 118 orphans. This support extends even further through monthly distribution to provide assistance to their siblings and children at the homestead so that close to 400 orphans and impoverished children are given support. 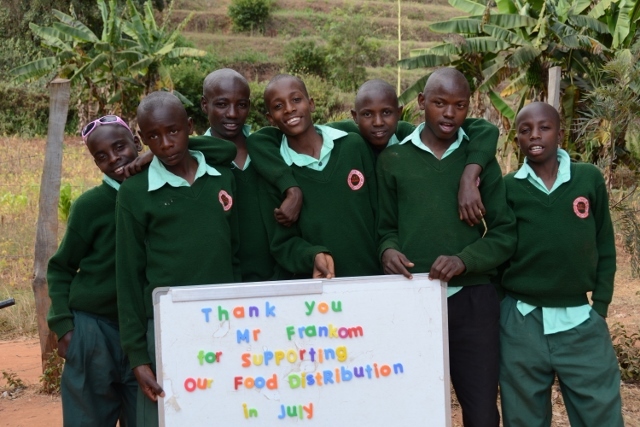 In addition we have taken on the educational costs of a number of children/young people who have no sponsor but would be unable to complete their education without that support. As noted in a previous update, we have found that our charges have become increasingly successful in obtaining higher marks and qualifying for high – and more expensive – levels of high school education as well as qualifying for post-secondary education. We have made a commitment to them – if they study and work hard we will provide funding for the highest level of education that they qualify for. This has been an expensive commitment that we intend to keep. While elementary school (1 – 8) does not have a tuition cost (although there are associated costs of uniforms, books, parent/teacher association fees, test and text book charges) there is a tuition fee for every year of high school. This fee depends on the ‘level’ of school as well as the specific school. Local is relatively inexpensive (less than $200 per year), while the tuition at a national school could be close to $1000.00 per year. Those at the regional and national schools most often reside in the school so the fees include room and board. 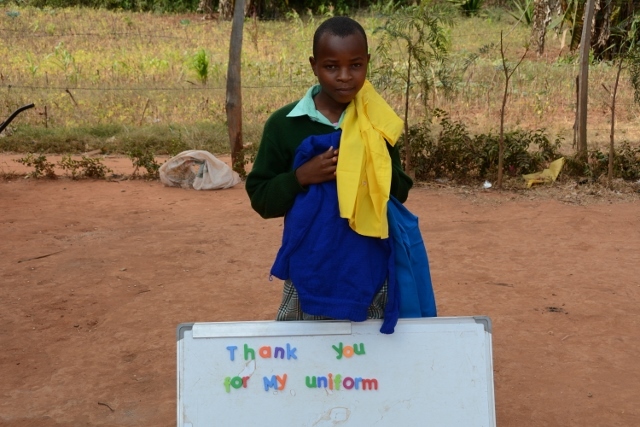 In addition to the tuition fees, each student needs to bring with them a kit which includes a mattress, wash basin, supplies, clothing, school supplies, text books and uniform. As well we need to provide transportation costs to enable the student to go between school and home during breaks. 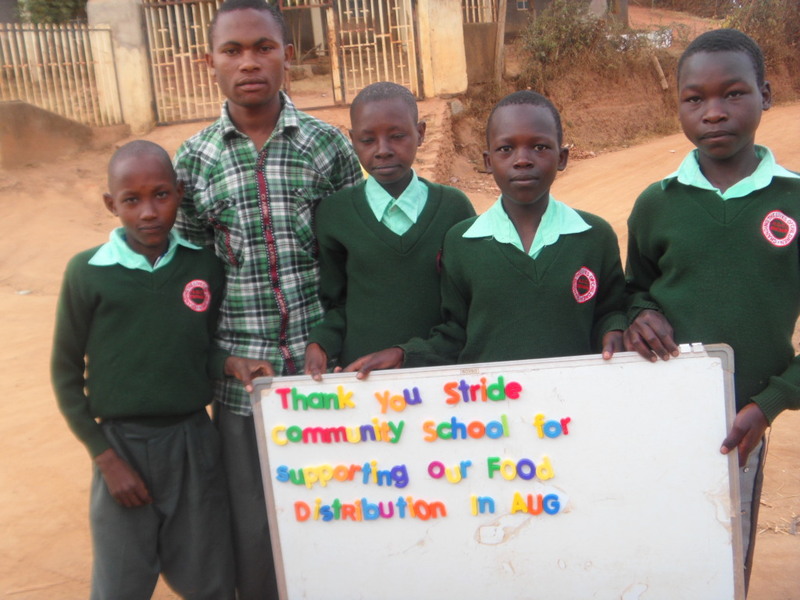 In addition there are necessary costs of providing clothing, supplies and food during the time that the student is not at school but either residing in our residence or in their extended family situation. Because we are small and flexible, we accept a wide range of support for our sponsors ranging from $30.00 per month, to some who have made a decision to provide $85.00 per month. 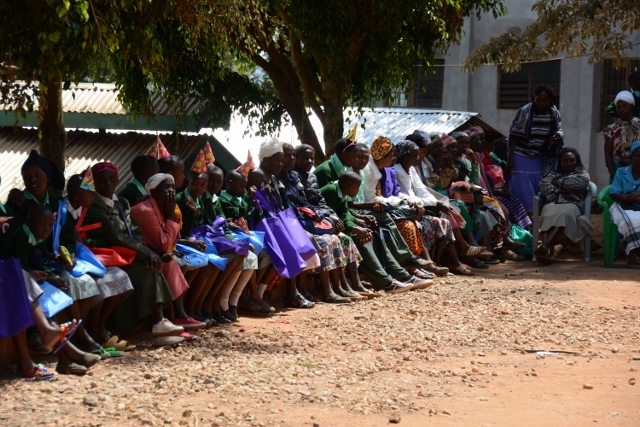 We then pool funding to make sure each orphan receives what they require. In the cases of sponsored children who are in an expensive school setting, the sponsorship fees are most often unable to cover expenses. We have, with the complete knowledge and agreement of sponsors, started to seek additional educational sponsors – people who will provide funds to help offset the educational costs. 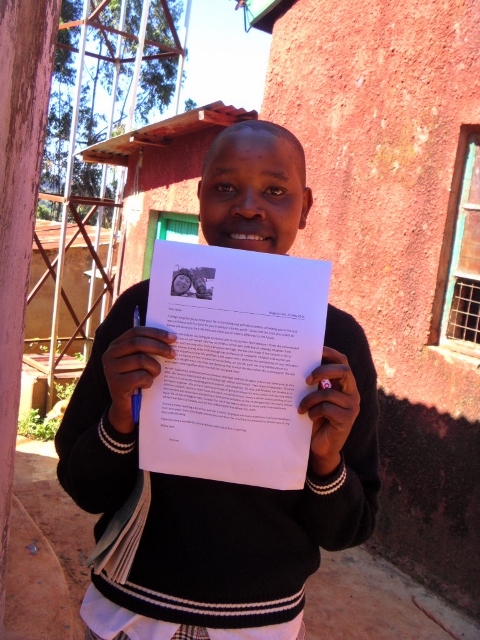 When approached about this one of our sponsors said ‘it takes a village (to raise a child)’. And indeed it does! The sponsor of that child remains the ‘parent’ of that child but we inform the student of the additional support. We hope to expand this donor network in order to provide the highest education possible for our orphans while allowing for these costs to be covered. We hope to make our village larger. 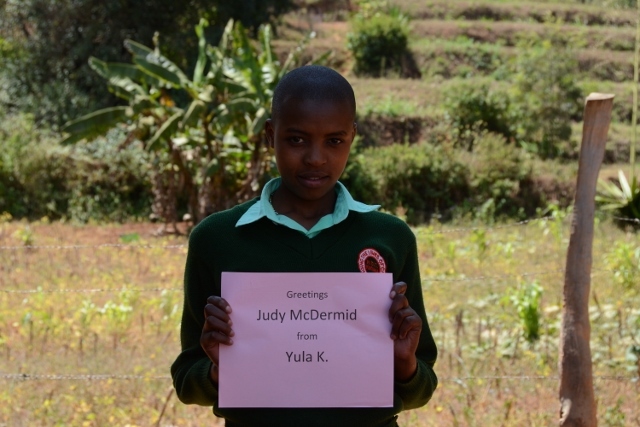 Each summer I have travelled to Kenya and brought with me sponsors and guests. Last year there were eight of us. The summer of 2011 had 18 guests. This summer I did not travel to Kenya. We had two visitors – Melanie and her son Skyler. They are the sponsors of two children and Melanie has also been incredibly generous in donating to other specific projects within our program. 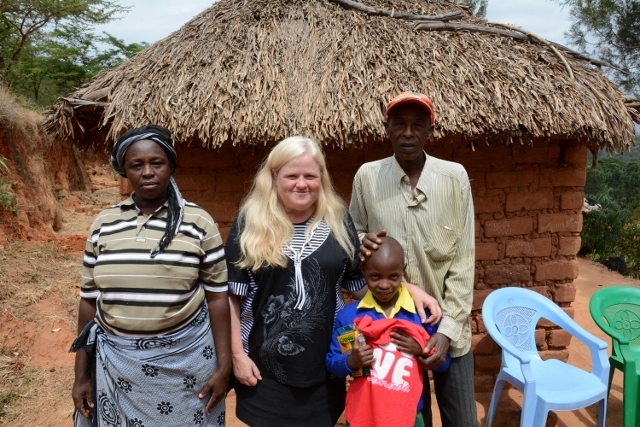 The highlight of these visits is the opportunity for our sponsors to meet their sponsored child. They go to visit the school and the homestead to see where they live and to meet the guardians and extended family members. Notice the picture of Melanie, Skyler and Frank hanging in a place of honor in the home. This is not only a highlight for the sponsors but one of the most special parts of my yearly visits – one I missed out on this year! Here is Melanie’s account of her visit. The day we arrived at Ruth’s home and the Hope Development Centre the cat, Lucky, had her 3 kittens and the cow gave birth to her calf. We were told we were a blessing – with our arrival came new life! What an amazing place! Set high up in the mountains with a spectacular view of the valley and mountains beyond, Ruth’s home and the Hope Development Centre exude warmth, caring and hope. 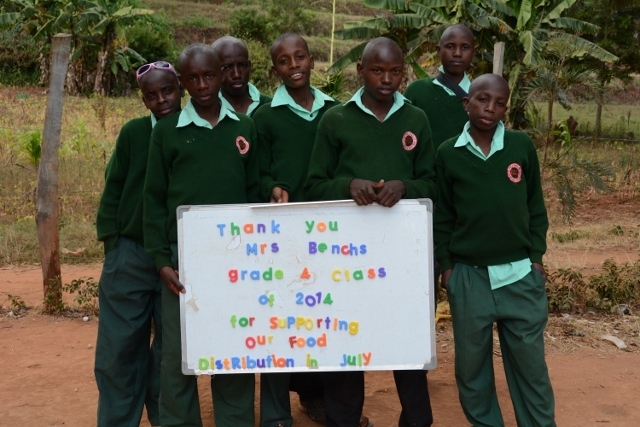 We arrived early in the morning so Ruth was at work and the children at school. 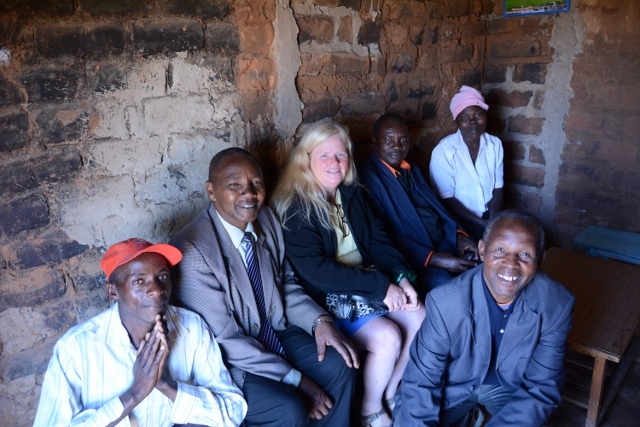 Skyler and I were given a tour of the property and introduced to the staff: Brigitta, Veronica, Michael and Redempta, who would welcome us and make us feel completely at home over the next 8 days. We truly valued the time we spent with Reverend Phillip (a kind and gentle soul), Phillip Kio (retired educator, our tour guide and Ruth’s right hand man), Sara and Faith. Faith and Sara are 2 of the orphans who have completed their high school education and are beginning college/ university in the fall, so they were available to accompany us on day trips. Both girls have tragic stories and a miraculously positive outlook and attitude toward life. Their smiles and laughter light up the room. They will go far and have a special place in our hearts. As the children returned from school each one of them shyly came over to us, shook our hands and welcomed us. What an amazing, polite, well mannered and well behaved group of children! When we ventured over to the residence, camera in hand, we got to see a much more lively, animated side of the children. They love the camera! 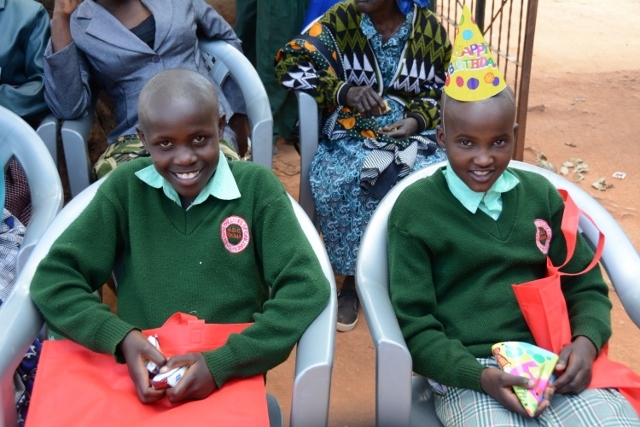 Skyler and I spent the first 4 days visiting my 2 sponsored daughters at their schools and homesteads, shopping for the children (pencils, pens, notebooks and a soccer ball), shopping for my girls, their families and schools, and helping to prepare for the birthday party. Loot bags were packed, food distribution packages prepared, Redempta spent hours baking and decorating the 15 birthday cakes. Friday evening was movie night, complete with popcorn and soda. The children were amazing. Technology proved to be uncooperative and then the power went out, but that didn’t hamper the children’s enjoyment. ..they broke into song. Party day was fabulous! Guests arrived in the HDC van and by Matatu. The children were excited, dressed in their HDC uniforms, and most of them, with their heads freshly shaved. This was a day they had been awaiting all year! Skyler and I had the wonderful task of picture taking and recording the celebration for prosperity and Eric’s new book “Today is the Day”. The children sang, food was eaten, business was attended to, loot bags, presents and food distributed and pictures taken. “Happy Birthday to Me” was sung and the cakes were cut and distributed! Hope was reaffirmed! Gratitude to God and the sponsors and other supporters was expressed. Happiness and smiles were plentiful as the guardians, children and chickens piled back into the vehicles to return home. 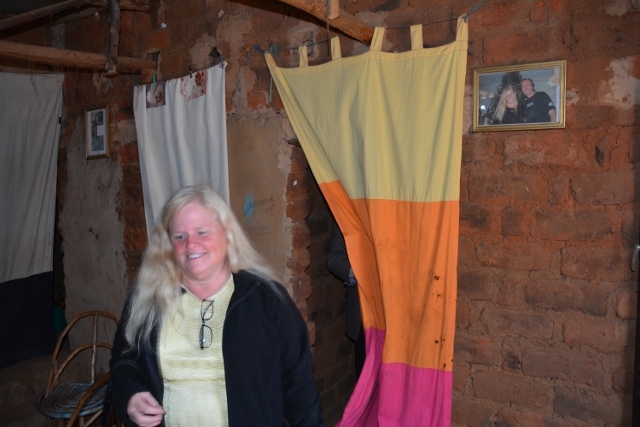 We had the pleasure of meeting Kay and her family in Nairobi. They welcomed us into their home and fed us a hardy lunch. 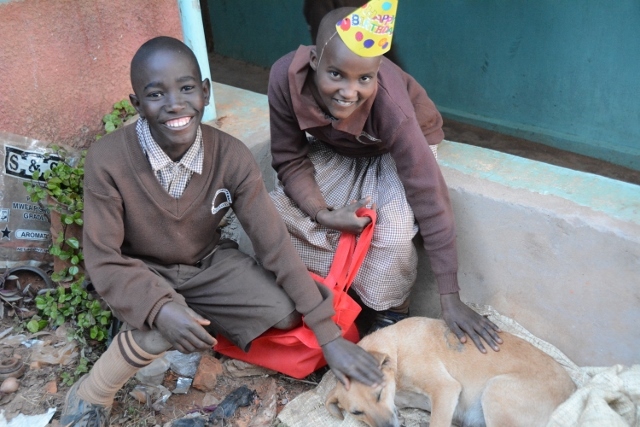 We met Kioko the first time while with Moses in the restaurant at the Kenya Comfort hotel in Nairobi. We got to know Kioko and his family as they spent a couple of nights in Kikima before the party and he drove us back to the airport on our final day. Kioko and Kay both have their mother’s smile and huge heart. Ruth! What a lady! Mother figure to all the orphans, extraordinary hostess (even in her absence), managing a farm, an orphanage and a full time job! Our first day there she worked until almost 9 pm, then the cow decided to have its calf and she was outside with her staff trying to get the calf to stand up and take milk until at least 2 am. We can’t thank Ruth enough for opening her home and heart to us. 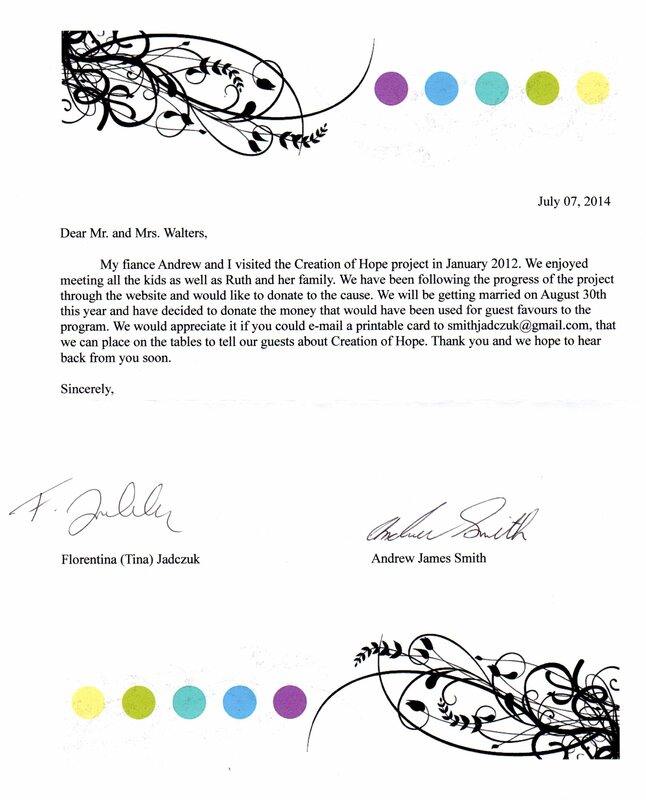 She made us feel welcome and like we were an important part of HDC and Creation of Hope. Skyler and I enjoyed every minute of our time in Kikima. We came to truly appreciate some things that we have previously taken for granted: our abundance of running hot and cold fresh water, and the degree of choice we have in our daily lives. I, as a working mom, sometimes bemoan the choice of what to have for dinner; trying to satisfy the desires of my family when there are so many possible choices. In Kikima the children are grateful to have food. Our only regret was that the children were in school (leaving at 5:30 am before the sun was up and the oldest children not returning until almost 7 pm as the sun was setting). When I go again, I will do it in August so that the children are on vacation and I can get to know more of them better. Reading that account made me miss being there this summer even more! Our hope is that we will travel to Kenya in December and return sometime in January. 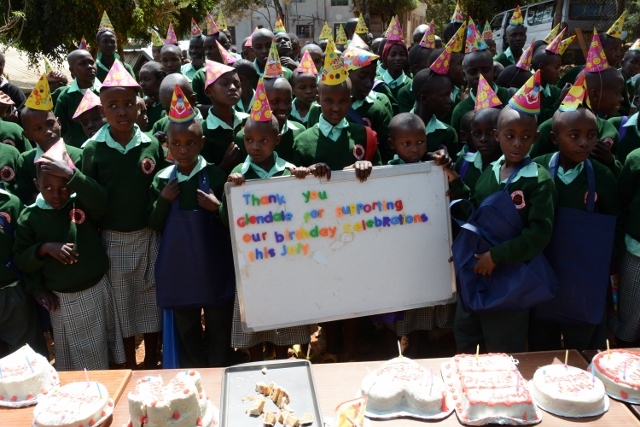 Each year we hold a birthday party for our children. This is a celebration to signify that their birth is a day for celebration. For many of our children it has another function. They are unaware of their birthday and without a birth date they cannot obtain a birth certificate. This certificate is a door that opens opportunities to them in life. 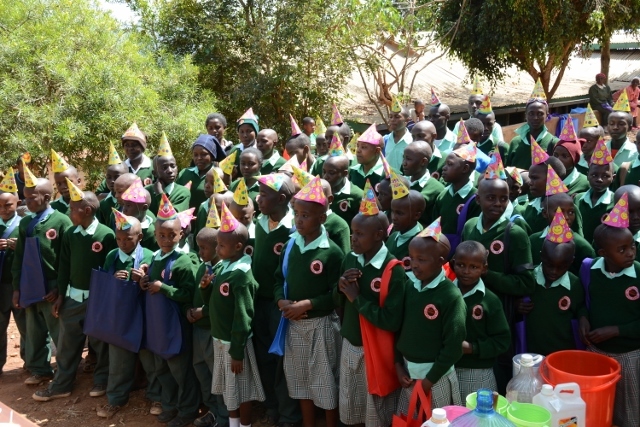 Our first party was for 54 children but now close to 150 children and hundreds of other guests partake of the birthday celebration. This year the special guests were Melanie and her son Skyler. The school where Melanie teaches also funded the costs of the party. At my request our guests took pictures of the celebration to be included in my upcoming picture book ‘Today is The Day’ about our celebration. This book, published by Tundra, will be launched in the fall of 2015. Here are some of the wonderful pictures! 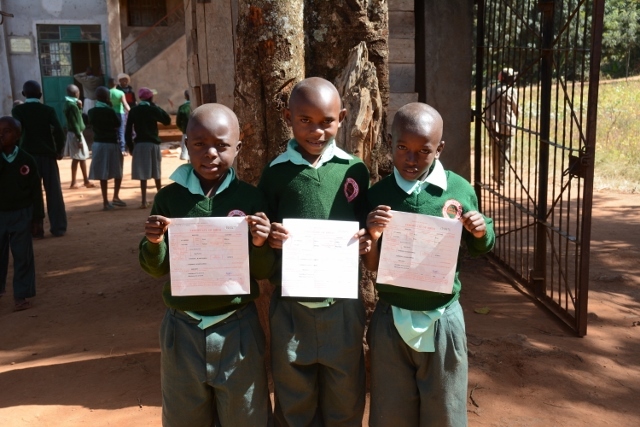 Children showing off birth certificates – a major reason for the party and celebration. On October 2, 2013 when author, Eric Walters came to visit Mary Immaculate School in Chepstow, Ontario he inspired our Grade 7/8 students with his tales of the children of Kenya. 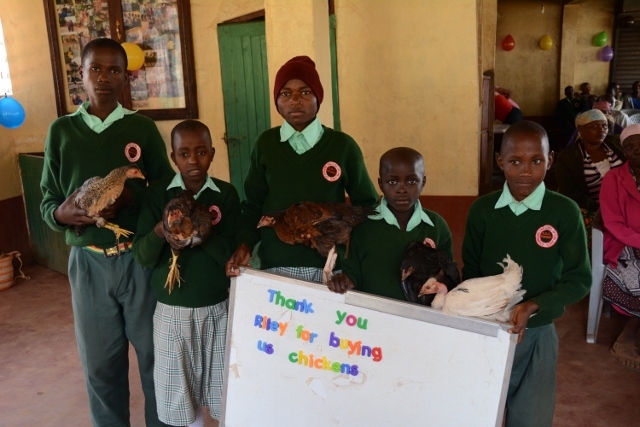 They decided they wanted to make a difference in the lives of those children, particularly at the Rolling Hills Orphanage. With an ambitious plan in place, they felt they could raise ten thousand dollars. To do this the Grade 7/8 students with the entire school supporting them have held the following events; Community Spaghetti Dinner, Christmas Bazaar, Silent Auction, Bottle Drive, and a portion of the money raised at our schools mission day was donated as well. By the end of the school year, $5200.00 was collected. With the money raised, part of it will help to buy a piece of land beside the orphanage with the remainder of their money going toward playground equipment. With this opportunity in social justice, the Grade 7/8’s eyes have been opened to the struggles and problems that people in third world countries face. With this experience in mind they intend to help the world more by doing more projects like this throughout their lives. We are so proud of our students for letting their light shine in such a worthy way. We have continued to negotiate the purchase of a piece of property. Purchasing land in Kenya is difficult for a number of reasons including the attachment the family has to land, and an attempt to elevate the price above what is reasonable. We continue to negotiate. While we hold onto some of the donation from Mary Immaculate in anticipation of completing the purchase, we have also directed funds from this to paying for the development of a second well for our orphanage. The water from the original well was insufficient for the needs of the residence and its expanding population. Sharon Freeman made a donation to honour Cecily’s memory. This money was used to help finance our monthly food distribution (see picture in that section below) and is closely related to Cecily’s vocation. She worked as a dietician. Thank you to Laura, Donna, Cheryl and Dorothy in memory of Ron Sielski, a family member. This donation was used to support the entire Rolling Hills Residence for two days. The thank you sign is in that section below. 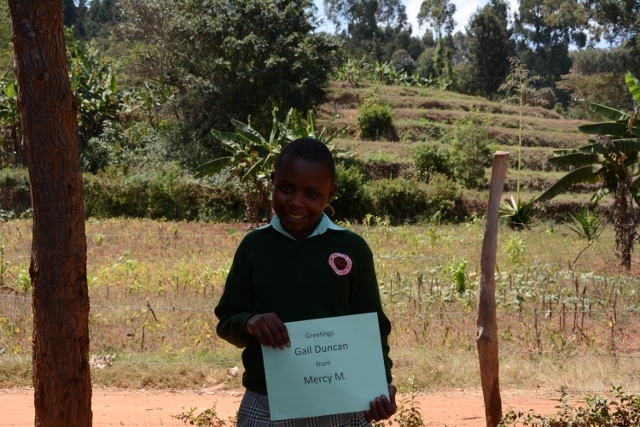 We are also celebrating a second wedding – that of Mercy’s sponsors Ray and Christina. 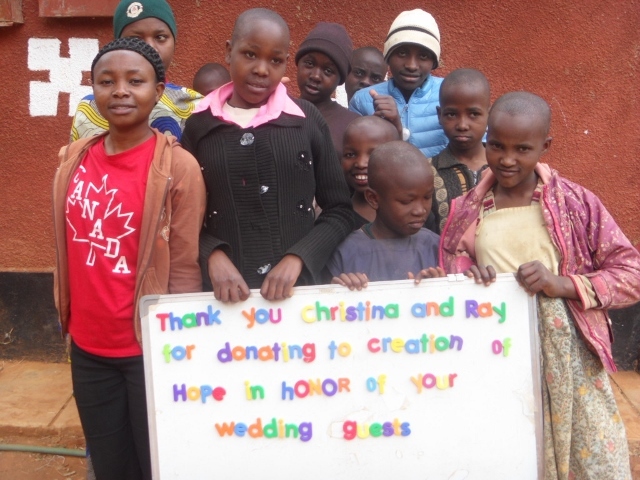 They have made a donation in the honor of their wedding guests. Mercy is in the photo with the red Canadian T-shirt. $100.00 per day provides food for the 55 orphans of Rolling Hills Residence, their routine medical care, basic school supplies, the salaries of all the staff associated with the building and all utilities for the building. 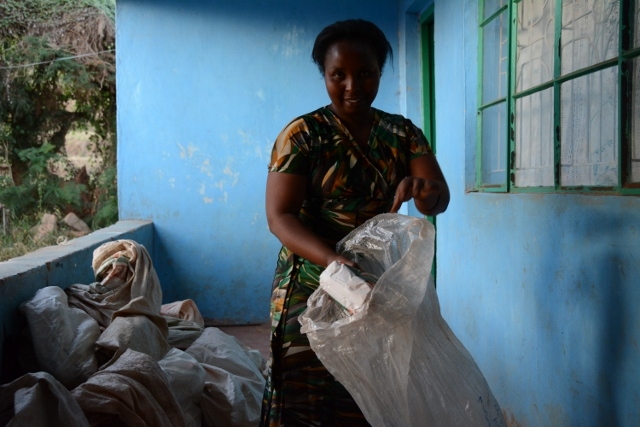 Our staff, Brigitta, helping to pack food distribution packages. 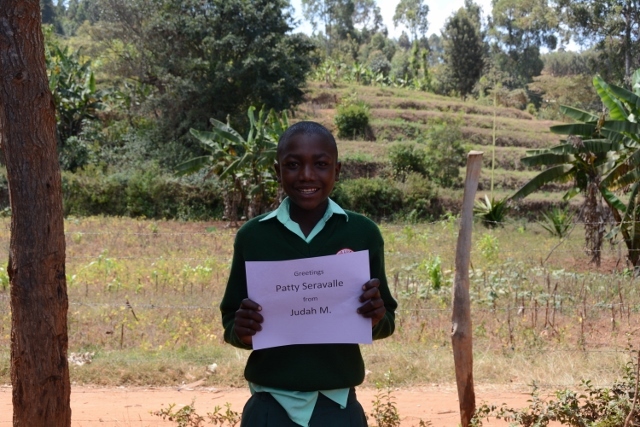 As one of her ‘tasks’ while in Kenya we asked Melanie and Skyler to take pictures of individual children that we could forward to their sponsors. They did an amazing job! Here are some of those pictures. 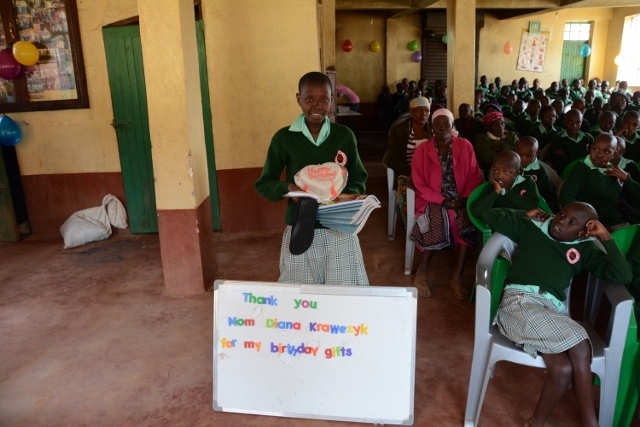 While some our sponsored children were away at residential school and not part of the birthday celebration we will soon be sending out individual pictures to many of our sponsors. 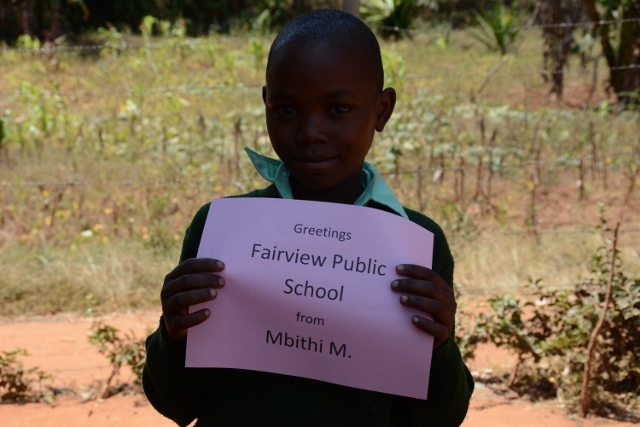 A letter from April and Michael – our newest sponsors.